"Our 12 strangers must adapt to the altogether-unfamiliar territory of an island where the states and the people are guaranteed those rights not specifically delegated to the federal government!" From the Nothing is Sacred Department, and the archives of The Onion, here is a handy Fake News Roundup for Civil War-related items of interest. Click on the headline for the full story. LOS ANGELES—CBS executives announced Monday that they have begun filming Antebellum Island, a new "alternate reality" series in which 12 strangers compete for $1 million while isolated on an island still under Confederate rule. ATLANTA—After years of conflicting approaches to interpreting the Civil War, a coalition of historians on Tuesday posited the non-specific theory that "you had to be there" to fully understand the complexities of the war. "It's not just a matter of 'Were the Southern forces as confident and dedicated as their Northern counterparts?'..." ATLANTA—The city of Atlanta was destroyed and 230,000 were killed Sunday when a group of overzealous Civil War buffs marched through the Georgian capital, burning it to the ground. There's nothing quite like a Civil War reenactment. Dressing in the woolen uniform of the period, eating hardtack and bacon, and firing black-powder rifles, we are transported back to those darkest of hours when our nation was nearly rent asunder by armed conflict. Brother against brother. Father against son..."
HUNTSVILLE, AL—According to Dock Mullins, the South will rise again as soon as he gets his old truck fixed up. History is a story, after all, and so it’s no surprise that people enjoy history most when it's told by a talented story teller. 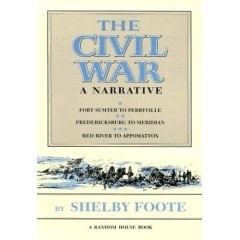 Shelby Foote’s 3-volume masterpiece, The Civil War, A Narrative, has no footnotes, and no bibliography. But students of the Civil War do not fault Foote for that, because the music of his narrative is mesmerizing, and the scope of his epic so grand. Foote himself explained, “I thought the footnotes would cost me more artistically than they would gain me in academic respect.” And he was right, but don't try this at home. This is not to say that more military historians or authors should dispense with footnotes or bibliographies. We could hardly take them seriously if they did. But Foote’s comments on melding artistic sensibilities with Civil War scholarship are interesting to consider. Much of today’s Civil War fare is so formulaic and dull, plowing through to the end is a tedious chore. When a book begins to feel like an onerous assignment, I quickly lose interest. It's dismaying to see how many historians can take a subject as spectacularly gripping as the Civil War era in America, and denude it of all drama, all human interest. Post-graduate training and the academy certainly demand rigorous standards, but suffocating the life out of the material is not one of them. Nor is all this to say that more military historians should take liberties, such as attributing thoughts or feelings to historic figures when those thoughts and feelings are not in evidence. [I remember receiving a copy of a much anticipated biography of Richard Ewell — much anticipated because there were none (this before Pfanz’s excellent tome filled that gaping biographical hole), and slamming it shut with bitter disappointment after encountering one too many descriptions of an officer’s imagined facial expression, or fabricated dialogue]. Infusing a work of history with the basic elements of a story doesn’t mean turning non-fiction into fiction. It means making it readable. Here are a few excerpts of Shelby Foote’s novelist-as-historian commentary from his 9/11/94 appearance on CSPAN’s BookTV, the transcript of which is here. I have a strong belief that novelists have a great deal to teach historians about plotting, about character drawing, about other things, especially the concern about learning to be a good writer, which many historians don't bother to do. I was happy the whole time. I never felt really different writing a history from what I'd felt writing novels. I believe that the artists are out front and have a great deal to teach historians about good writing and dramatic composition, which I consider the best history to be. Aristotle said, in criticizing great drama, that first you learn how to write well -- a good sophomore in high school can do a surprisingly good description of a sunset — then you learn to draw characters that can stand up and cast a shadow, and the last thing you learn to do is plot. That's the skill that comes last, if it comes at all. That is where I think historians neglect a huge advantage. I think history has a plot. You don't make it up; you discover it. It's there. Oscar Wilde talks about life imitating art. I have noticed that when a man dies, no matter at what age or by what cause, his life then has a beginning and a middle and an end, and sometimes his death explains his youth. Good friends of mine who were killed in the war spent their youth exactly as if they knew they were going to be killed. It's a very strange business, but that's art taking over, insisting on giving a thing form when it seems to be formless. I think that when you supply that form — and, mind you, I'm not talking about superimposing it; I'm talking about discovering the form — it makes that a very exciting reading experience. Recently I've been revisiting James W. Loewen's, Lies Across America, What Our Historic Sites Get Wrong (introduction here), and I'm reminded of what an entertaining read it is, though the author gets a little too strident at times for the mostly repressed Norwegian bachelor farmer part of my sensibilities, which wants to acknowledge historic lies without embarrassing anyone I know. But it's an engaging book (like the author's earlier, Lies My Teacher Told Me -- see intro here), and as you might imagine, the Civil War period is well represented. Of course we all know instinctively that America's monuments and roadside markers, like the history books of our youth, are, often as not, studies in myth-making and local boosterism. And for some groups, it was a grand cause. The Masons may have managed to put up the only statue of a Confederate general officer in Washington D.C., but they got it in under the radar by steering clear of The Late Unpleasantness connection. Only the United Daughters of the Confederacy managed to honor the Confederate dead of a place from which no living Confederates originated. Beat that, Masons! According to Loewen, "by 1916, this [Helena] monument declares implicitly that the Confederacy was somehow patriotic and that whites agreed, even this far north, to honor it nostalgically. Thus this monument also reflects the time when it was erected — the nadir of race relations in the United States, from 1890 to 1920, when segregation gripped the nation and lynchings reached their peak. Most Confederate monuments went up during these years" (103). As an aside, these incongruous images caused me to think again of Richard Brautigan's, A Confederate General from Big Sur, a novel I read in high school in Iowa, when both the Confederacy and Big Sur were fictional, far off places. I found a cheap ex libris copy online, and am curious to read it again, particularly since those fictional places have become regular haunts in my life. I sure hope my (embryonic) Great California Novel gets a better review. Is a short story masterpiece harder to write than a good novel? You can certainly make a case, however arbitrarily one rates different forms of fiction. The same holds true for non-fiction, to a certain degree. Of course there's no substitute for prodigious works of research that aim to comprehensively cover a particular subject, or era. But at some point they are no harder to write than a shorter work, only more time-consuming, or more demanding of sustained, single-minded devotion. Crafting a narrative of solidly concise prose in non-fiction is not only highly valued in historical texts, it is a talent generally sought (if rarely found) in professional communications from journalism to corporate memoranda. Done right, less is more. Done wrong, it's just less. I was given pause (extended, hair-pulling pause) to chew on these things while working on the Library of Congress Civil War Desk Reference. I composed first drafts for dozens of sidebars and short essays on everything from Commerce Raiders, and Civil War era Photography, to the Federal Ambulance Corps and the Emancipation Proclamation. To do justice to any of these topics in a few hundred words — finding the essence, or the kernel that casual readers would take away and that students of the subject would find meaningful — felt more challenging than writing 3,000 words on each, when the constant urge to digress and qualify is easily satisfied. Every cut in the rewriting process subtly shifts the emphasis. Every clarifying fix necessitates trimming another bulge elsewhere. Which brings me to the subject of single-volume histories of the war. I own and have enjoyed the two best, single-volume studies, James McPherson's incomparable Battle Cry of Freedom, for which Oxford Press recently brought out a spectacular illustrated edition, and David Eicher's military-oriented The Longest Night. Both are notable accomplishments. But what about brief, single-volume histories of the war? That's where the painful editing comes in, and where the author's instincts and judgments are on display in every paragraph. That's where we gain a sense of the author's mettle, and learn whether the author has mastered the art of knowing when to shut the hell up. The Civil War is a long story. So few among us know how to make a long story short. I think I read the National Geographic volume that one used to see around in battlefield park bookshops, and used bookstores — I remember having it in my hands night after night, I just can't remember reading it (mainly, I remember people complaining that the cavalryman pictured on the front cover was from the wrong era). I also read, a long time ago, Fletcher Pratt's Short History of the Civil War (originally released as Ordeal by Fire). Flipping through it again recently I see how dated it is, though the relaxed style of the narrative is sometimes gripping, and always engaging. It dates to the 30's, and so I am reflexively, and perhaps unfairly, suspicious about the level of scholarship, and turned off by the free and generous use of unattributed quotes. Not to disparage Mr. Pratt — the Fletcher Pratt award by the Civil War Round Table of New York is appropriately prestigious in Civil War book circles. But, the brief history of the war that I always come back to, and that I unhesitatingly recommend to anyone looking for an outstanding introduction, is Charles P. Roland's, An American Iliad (University Press of Kentucky, 1991). At 289 pages, it's roughly a third the length of Eicher's and McPherson's works, but packs a punch. Roland's volume is a synthesis of the best writing on the subject, and his talent for condensing that scholarship into a graceful narrative — covering the build-up to the war, and wartime politics, as well as military events in all major theaters, while profiling principal figures — is a thing to behold. It's invigorating to read the saga of the Civil War in a brilliantly paced distillation over the course of a handful of sittings. Unlike the campaign studies and biographies that occupy so much of our time, a single volume narrative like Roland's brings the broad scope of the war back into focus, like a reliable wide-angle lens that still allows for sharp detail in the foreground. An American Iliad does not have notes, only a well-considered bibliographic essay at the end. Roland's experience — his lifetime of researching, writing, and teaching — translates into an authoritative, objective delivery that leaves readers untroubled by the absence of specific documentation. His work has held up in the face of critical scrutiny, and that makes all the difference. I sat next to Professor Roland at dinner one evening during a Civil War Round Table Associates conference, and was very taken by his friendly, unpretentious demeanor. He was smart and humble, and seemed genuinely honored to be asked to speak to our small assemblage. Many years later I came across more information on his life, which looks like it makes for an interesting story in its own right. Next time some non-Civil War type or student asks you for a recommendation, don't start them off on such a daunting assignment as Foote's trilogy, or one of the hefty tomes mentioned above. Send them to Roland, and they'll wonder why they haven't already read more of this endlessly fascinating story. -- discussion of this posting can be joined here. 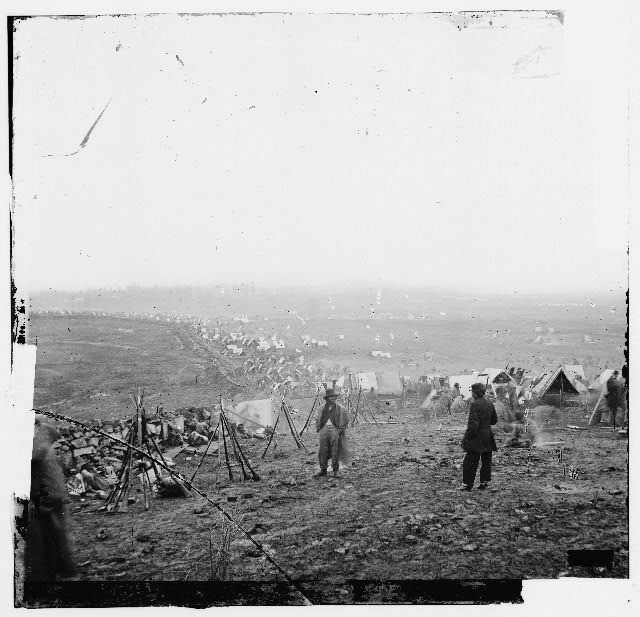 Every late March or early April, before the crowds of summer are unleashed, before the lines of sight and sweeping views are obstructed by new spring foliage, three or four dozen members of The Civil War Forum gather for a few days of battlefield tramping. We drive and fly to the chosen destination from far and wide, from Canada and the U.K., from California, the Eastern Seaboard, from the Midwest and the Deep South. This year will mark our 10th annual get-together, and the featured fields will be Franklin and Nashville. Many of those in attendance are regulars – veterans of all of our battlefield conferences – some are occasional participants, and a handful each year are newcomers who chanced upon the Forum, or who saw the event listed on an events calendar somewhere. All are welcome, but seats are limited. We always restrict the registration to one full bus, since two is unwieldy, and because so much is missed if you’re not on the bus with the tour guide, who narrates events and relates stories from one stop to the next. Every year we alternate between Eastern and Western/Trans-Mississippi venues. We round up the best local guides and speakers, find a clean, comfortable hotel as our headquarters, and enlist a much-recommended caterer for our evening banquets. These yearly gatherings are effectively intensive seminars on a given battle or campaign (about which we read for weeks or months in advance). Because we aren’t trying to make a profit, we’re able to hold the costs to bare bones, though our raffle of donated items usually generates enough for a modest donation to the Civil War Trust. I invite anyone reading this to join us. We have around 20 people signed up so far, and another half dozen committed to coming. That leaves approximately 20 seats available on the bus, most of which I expect to be snapped up after the the Feb/Mar issue of Civil War News ships this month, which has a listing in the calendar and a small ad regarding the event. All registration details and itinerary can be found here, and in the Forum. This year we’ll start off at noon on March 23rd for our optional Thursday outing: 4 hours on the Stones River battlefield with the incomparable Jim Ogden, historian at Chickamauga/Chattanooga but no slouch when it comes to Murfreesboro. Thursday night we’ll formally inaugurate the meeting at our hotel with a reception/cocktail hour, dinner, and a presentation by Carter House director Thomas Cartwright, who will set the stage for the first full tour. All day Friday we’ll be on the bus with Tom to cover Franklin sites, before retiring to the hotel for more evening events. Mark Zimmerman, author of Guide to Civil War Nashville, will conduct the Saturday tours of Nashville sites, and will deliver the presentation at the Saturday evening banquet. Arrangements for the optional Sunday morning outing are still being ironed out. Over at Mike Koepke’s Civil War Musings, the blog entry for January 2 quotes from and links to a Brian Wills essay recalling Patrick Cleburne, and championing preservation efforts at Franklin. We can all be thankful for their perseverance. This will be my first visit to Franklin since the Pizza Hut, reputed to be on the site of Cleburne’s death, has been torn down. It’s a small, but meaningful victory in an area where so much of the 1864 landscape has been irrevocably lost. I hope to meet some of you at Franklin in March. More excerpted replies from the 1995 Civil War Regiments journal survey. On Burnside: No man I've ever seen has such a head as Burnside. On Dan Sickles: a gamey looking bird, and a fine specimen of majestic indifference. On the death of division commander Amiel Whipple at Chancellorsville: How any bullet ever pierced General Whipple's armor of dirt is a mystery of mysteries. I considered him perfectly safe from any missile weighing less than a ton. . . .
On division commander David B. Birney: he was as expressionless as Dutch Cheese, and could serve as a bust for his own tomb. On Third Corps commander William French ("Old Blinkey"): He is so repulsive in appearance as to invite nausea at the sight of his bloated and discolored visage. He looks a perfect old soaker, a devotee of lust and appetite. One eye has a habit of blinking, which makes it seem drunker than the rest of him. A Stillness at Appomattox, by Bruce Catton. The 1954 Pulitzer Prize-winner is "a brilliant, evocative book that not only tells the story of the last days of the war in Virginia, but paints a startling picture—in various shades of grays and browns and reds—of what life was like in the Army of the Potomac during the months leading up to victory. Embattled Courage, The Experience of Combat in the American Civil War (New York, 1987), by Gerald F. Linderman. After reviewing this book for a journal, Marszalek was so impressed he assigned it as required reading in his Civil War and Reconstruction course at Mississippi State. "The strength of Linderman's book," Marszalek writes, "is that it allows the reader to get into the mind and spirit of the common Civil War soldier and begin to understand why he was able to fight as he did." Linderman's book is, he concludes, "an example of masterful research and an engaging writing style." McDonald first thought of Hood's Texas Brigade, by Col. Harold Simpson, plus the three supporting volumes—"it's difficult to imagine anyone doing a more thorough study or getting more data before the public about any unit in any nineteenth century war." But for our purposes, he settled on The Third Texas Cavalry (Norman, 1993), by Douglas Hale, because, among other reasons, Hale's "book could be used as a prototype of how this kind of thing should be done." Hale, McDonald tells us, "researched in all the right places," including 24 county courthouses. The Twentieth Maine, a Volunteer Regiment in the Civil War, by John Pullen. Says Pullen, "He [Chamberlain], William Oates, Ellis Speer, and others provided Pullen with unusually rich primary source materials and eyewitness accounts." Marvel, who I see had articles in two recent magazines, distinguishes between more recent secondary works of original research, and works written by individual veterans, committees of veterans, or writers enlisted by veterans. In the first category, he does not hesitate to declare The Twentieth Maine, a Volunteer Regiment in the Civil War, by John Pullen, as "the premier example." In the second category, he was "most impressed" with John D. Billings, The History of the Tenth Massachusetts Battery of Light Artillery (Boston, 1881), who also wrote the much-loved Hardtack and Coffee. Like the 20th Maine, Marvel writes, the 10th MA Battery, first saw action later in the war, and "because of that late start the veterans were able to observe their surroundings more philosophically, leaving them with a different viewpoint than those who were thrown early and often into the front lines." The Campaigns of Walker's Texas Division (Austin, 1994), by Joseph P. Blessington. "The most powerful value of Blessington's narrative stems from the vivid information included directly from the diary he kept throughout the war, along with supporting testimony he later obtained from former comrades. Although the diary itself is now lost, its singularity can be recognized from the many passages in the book wherein Blessington obviously quotes from his daily entries, producing an immediacy and veracity too often missing from so many postwar reminiscences." Mr. Pfanz deems a useful unit history to be one compiled by one of its members, one that deals almost exclusively with the unit at hand "in a reasonably full and intimate way, describing what and how things were done." Meeting those standards, he names Nathan Appleton's, History of the Fifth Massachusetts Battery, Marvin A. Haynes's, A History of the Second Regiment, New Hampshire Volunteer Infantry, William R. Kiefer's, History of the One Hundred Fifty-third Regiment Pennsylvania Volunteer Infantry, and George K. Collins's, Memoirs of the 149th [New York] Regiment (Syracuse, 1891). Pfanz's essay concentrates on the attributes of this last title, about which he writes, Collins avoided "flowery phraseology and ventures into the 'big picture' that often burden unit histories without adding to their usefulness. He has provided posterity with a valuable glimpse of a segment of the Civil War as it must have been." Pohanka names three titles, the first of which he purchased when he was 12-years-old: Charles H. Weygant's 1877 History of the One Hundred and Twenty-Fourth Regiment, N.Y.S.V.,—the "Orange Blossoms," the author of which "witnessed the gallantry and horror of Gettysburg, Spotsylvania, and Petersburg." Another favorite named by Pohanka was The Story of Our Regiment, A History of the 148th Pennsylvania Volunteers (reprinted, Butternut & Blue, 1994), edited by former adjutant J. W. Muffly, heavily illustrated and heavy to hold at 1,096 pages. Lastly, Brian listed Alfred Davenport's 1879 work, Camp and Field Life of the Fifth New York. Somehow we knew that Duryee's Zouaves would come up. History of the Twelfth Regiment, New Hampshire Volunteers in the War of the Rebellion (Concord, NH 1897), a regiment that possessed a "good soldier-historian." Bartlett canvassed his compatriots for surviving letters and diaries, and included biographical sketches and dozens of individual pen portraits of regimental members. All this and more, Robertson says, "complete a work that will always serve as a model for a unit history as all-inclusive as it is wonderfully human." A History of the 73rd Illinois -- "the Preacher Regiment" -- composed by a committee of three. Over 100 of the book's 682 pages deal with the actions from Spring Hill to Nashville. Sword writes, "anyone seeking a candid 'inside story' of the Hood Tennessee Campaign is well advised to find a copy and enjoy some of the best raw data to be found in any post-war era regimental history." James J. Williamson's, Mosby's Rangers, the best, Wert says, of the works written by members of the command. Published in 1895, revised in 1909, "Mosby's Rangers follows the format of a journal, but is neither repetitive or dull." Wert compliments Williamson on his accuracy. "Minor mistakes of fact and memory lapses intrude, but the book holds up well under the scrutiny of modern scholarship." Here you'll also find the largest group of photos of individual Rangers in any published account. The long-time editor of Kent State's Civil War History journal chose to highlight B. H. Liddell Hart's Sherman: Soldier Realist, which he read as a doctoral student at the University of Illinois. "Hart is a superior biographer because he develops Sherman's personal traits clearly and persuasively and with an elegance of language seldom matched. . . . Academic historians would profit as well from a careful reading of Hart's comments on research and annotation." Theo F. Rodenbough's, From Everglades to Canon With the Second Dragoons (New York, 1875). Of Rodenbough's works, Miller writes, "Perhaps we cannot see, touch or smell the past, but in the hands of a talented and knowledgeable narrator, we can very definitely feel it." In 1861, the Second Dragoons became the Second U.S. Cavalry, not to be confused, Miller says, with the more famous Second Cavalry (of Johnston, Lee, Thomas, et. al. fame), which became the Fifth U.S. Cavalry in 1861, which overshadowed the exploits of her sister regiment. "The sections dealing with the Civil War are not the strongest part of the book, but the big war was not necessarily the period most remembered by the survivors. . . .For those of us who love biography, military history, or who feel some admiration for those self-reliant souls who set off across prairie or desert with not much more than a horse and a revolver, this is a memorable book." The Confederate Cherokees: John Drew's Regiment of Mounted Rifles (Baton Rouge, 1989), by W. Craig Gaines. It treats subjects outside the main theaters of war, and indeed, outside the mainstream societies in the warring sections -- the tragic story of a war within a war. "Drew's regiment was not one of Fox's 'Fighting 300.' Indeed, they did not even complete their one-year term of service. The are remembered chiefly for having taken Federal scalps at Pea Ridge, and hold the distinction of being the only Confederate regiment to desert almost entirely to the Federal side. Thus, what begins as the story of Drew's Mounted Rifles effectively ends as the story of the 3rd Kansas Indian Home Guard Regiment." It likewise has one of the most colorful of all regimental rosters, with names like "Second Lt. Crab Grass Smith and Sgt. Bat Puppy of Company K, Pt. Dreadful Water of Co. H, Moses Dog in the Bush of Co. B, and Co. I's Young Squirrel Flopper. Dozens of other soldiers' names were recorded without translation, as one member of Co. B, Private Pa sooz or kie Cah lor nu hay skie." James Taylor Holmes's, Fifty-Second Ohio Volunteer Infantry: Then and Now (Columbus, 1898). "It is a very rare, hard to find title, but unusual and exceptionally good book, both in content and literary quality." It is more a personal memoir than a regimental history, Castel writes, consisting of "excerpts from Holmes's diary and letters written during the war, of his memoirs based on those documents, and finally on an account of a visit he made in the 1890s to the battlefields where he fought during the Atlanta Campaign." Castel found it extremely useful when writing his Decision in the West.